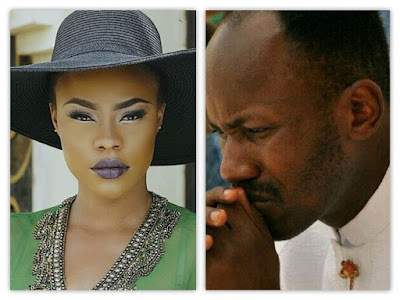 Nollywood actress, Daniella Okeke has finally responded to allegations that she had an affair with the General Overseer of Omega Fire Ministries, Apostle Johnson Suleman. Ms. Okeke was mentioned by Suleman’s self-proclaimed lover Stephanie Otobo, as one of the pastor’s many girlfriends. Suleman was alleged to have bought a Mercedes Benz 450 GL for the actress. Ms. Okeke has now taken to her Instagram page, to respond to the allegations, describing them as “lies” and “fake stories”. She said: “In adherence to my lawyers counsels, I’ve been mute since I read some funny fallacies. My lawyers will do the talking.